High Mark Manufacturing has been making folding tables for several years. During that time we have watched the industry shift toward bigger, nicer and more comfortable laundries. 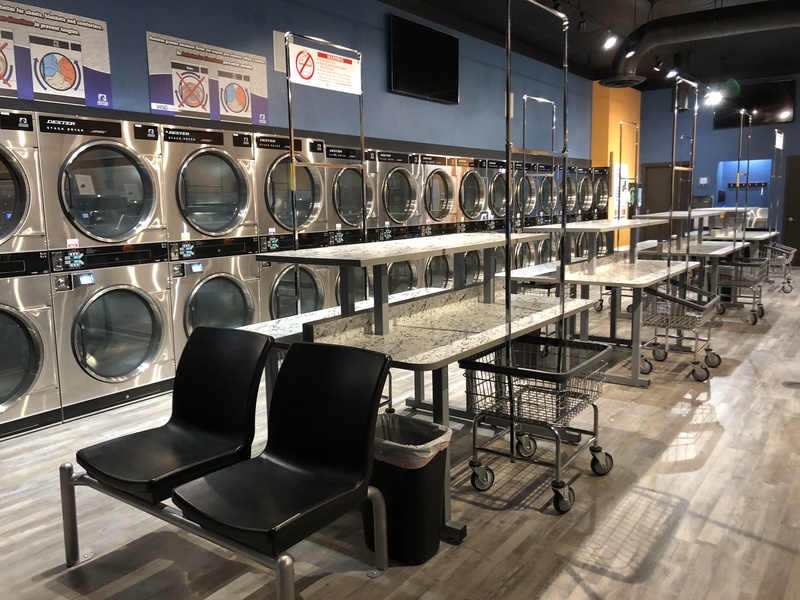 We recognize that many investors are breaking from the look of traditional laundries and are building stores with a modern aesthetic or timeless design. To provide what the industry is calling for, we are in the process of expanding our furniture department. 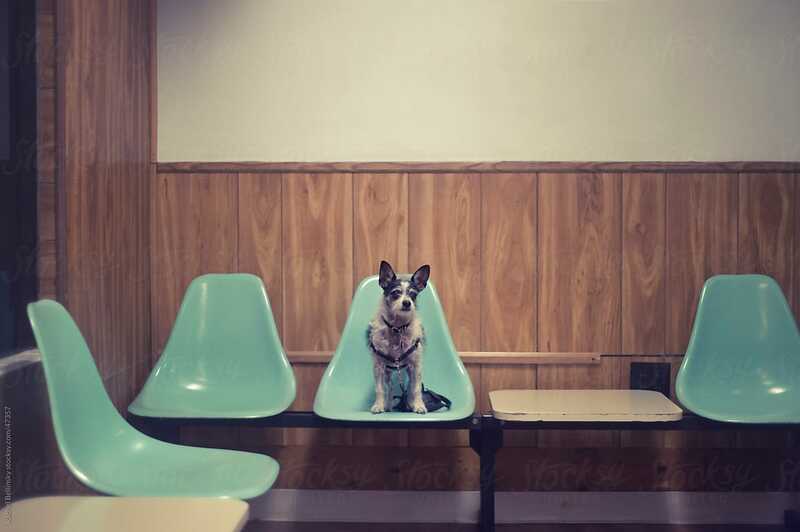 We are designing some new offerings and we want to consult the experts - those of you who are building and managing successful laundromats and driving change. Please give us your feedback - tell us what you would like to see, how our tables can function better for you, what kind of style you would like them to add to your space, or whatever else you would like to see us take into consideration. We're also looking for input on other furnishings. Are you looking for work station bars and movable stools? Smaller tables with fixed stools? Alternatives to expensive tandem seating? We're looking forward you hearing from you! 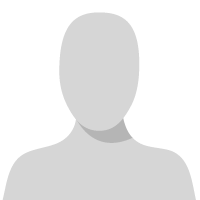 I am happy to offer input based on my 50 years of experience. 1. Enough clearance below so that carts fit under them. 2. Extremely durable and scratch resistant surfaces. 3. Strong support legs without angular support structures that can damage cart bumpers. 1. A single oposing seat fixed to each side of a 24" x 30" table. 1 or 2 customers can sit and eat a snack or use their smart device at this narrow, compact unit. 2. A 24" x 48" table with 2 sets of 2 oposing seats. 1 to 4 customers can sit and eat a snack or just talk as they face each other. This unit takes up about 50% more floor space than the 2 seat unit. 3. A 2 seat side by side unit with a 20" x 18" table between the seats. This 68" wide x 18" deep unit accommodates 1 or 2 customers who can watch TV, use a smart device or eat a snack. Customers like elbow room so adequate separation between seats is desirable. All seats should provide maximum comfort without sacrificing durability. Seats should include back support. A table adjacent to the seats is a handy feature for customers. Long tandem (5 or more) seating units are less desirable because a single customer occupying the unit limits functionality as other customers will avoid sitting down even if an empty seat can be left between the first customer and the arriving customer. A wide range of color options is desirable to aid in achieving the right "look". 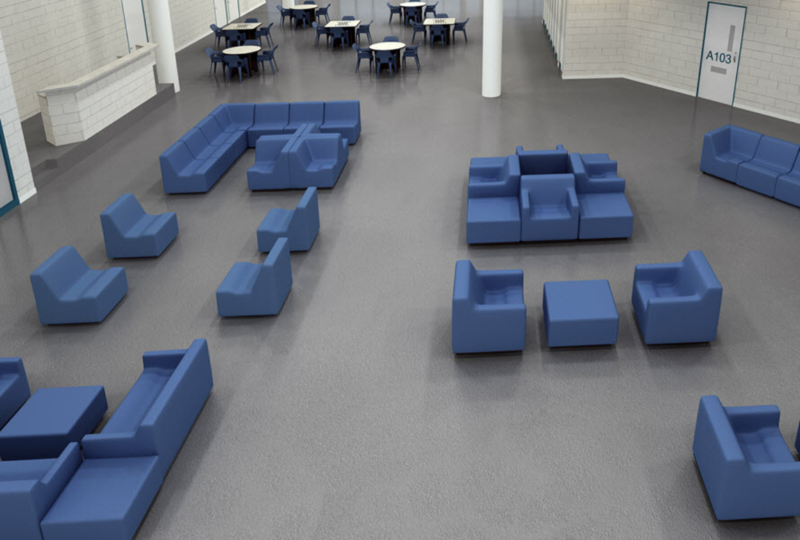 Again, durable, comfortable and functional seating and folding tables should be your goal. I'd like to see furniture that could easily be configured and bolted together to fit any space. You could pick the number of chairs,side tables, make 90 degree turns.Modern colors and arms on the chairs. Larry and Chris - thank you! All are very good suggestions and I have passed them along to the appropriate parties. We will keep everyone posted as we make progress and have things to share. A while back someone posted about purchasing old furniture from juvenile detention center. These items were awesome and indestructible as well as comfortable but I fail to remember who was the ingenious person who did this. I could not find any used ones availible at the time and the new ones were rediculiouly expensive. The furniture you are referring to is made by Norix. I remember reading that post and when we were searching for indestructible furniture we found it at Norix. We bought from their markdown/clearance items. When Norix retires a color they sell the remaining items at a 25% to 30% markdown. We bought the Gibraltar Series and love it. We bought 2 seat and 3 seat configurations. Because Norix manufactures each order specifically to a customer's request, you can order seating in 2s, 3s, 4s, 5s ..... configurations. We also ordered bolt down attachments on ours. We drove over two hours to sit in a Norix seat before going forward with our purchase. Buying markdown items, we spent no more than I was quoted by several other "laundromat seating" manufacturers. Government offices, hospitals, detention centers, etc are typical Norix customers. We have been open 10 months are our seats are still as lovely as the day we opened. 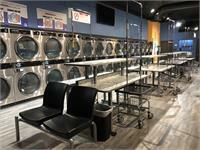 You are welcome to visit our facebook at Twin City Laundry, Longview, WA or our website at www.twincitylaundry.com if you'd like to see pictures of the seating we selected. Rick or Martha, Where did you get your folding tables. They look pretty nice from the pictures on ur site! Our tables are HighMark tables. Char helped us fabulously in our selection. Our customers LOVE our tables!! So people are looking at other options online and they are a plenty.... Plus a new mat is just getting it custom built on site the way they want like a granite top table which will last longer than the mat. So take the GODFATHERS advice and DROP your prices. There is nothing wrong with what you sell as I have it my mats !!! I absolutely agree with selling directly to the mat owners!!!! It's very frustrating having to do EVERYTHING through a middle-man. The telephone game comes to mind and many times things are not communicated correctly when going through a middle-man. You need to update your color choices, primary colors went out of style in the '70s. Honestly, I looked at your stuff when I started my rehab and instead shrugged my shoulders and bought surplus restaurant stuff, I don't think in 2019 people want to sit on fixed, hard chairs that are connected to fixed tables. Some folks are fat, some have kids, using what is really suitable for outdoor park usage simply isn't all that comfortable. If you look at newer airport terminals, seating options allow a lot of different ways to wait, which is what we're doing in laundromats. Just the other day, I saw a terminal with high tables fixed to the floor with high stools (with backs) that could be moved around. Then there were some desk areas with movable chairs and then there were the standard all lined-up-next-to-each-other seats. Passengers filled up all other seats than the lined-up-next-to-each-other first. People waiting want tables and chairs that move. Lastly, when I bought my store, we had a Hi-Mark seat cluster. I put it in Craigslist for free and away it went. There was no way we could work with the colors. This is just not something I'm going to offer to customers. I'd rather use four surplus restaurant chairs and a small surplus restaurant cocktail table. With my store, I inherited a lot of Hi-Mark folding tables. Good news? Nice and sturdy. Bad news? Colors were awful and dated, plus the laminate hadn't held up. I paid a couple hundred bucks a table to have a custom finish put on that we're happy with. i would have bought all new tables, but the finishes available at the time were the same as I wanted to go away. I see on the website now that you offer "hundreds" of finishes, you need some pictures. The table quality as I said is good, no complaints. But the finishes weren't great, lots of scratched initials and stuff in the laminate as well as the corners/edges wearing away. As I said earlier, I recently took a trip and was really amazed at what airports have done to seating and furniture. You folks should do some investigating so you can modernize. I suspect that Char started this thread because she wants to start with a clean slate and design a new furniture series specifically for laundromats. Airport furniture looks nice but I wonder how many laundromat operators would be willing to pay for that high grade stuff. The problem with current laundry furniture is what they charge for a bit of fiberglass, laminate and MDF that looks like something from the 70s. 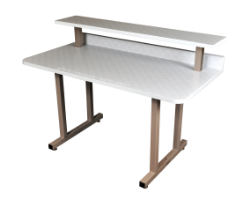 A quick search can verify that airport seating and stainless work tables are cheaper and more attractive options. Walk into any fast food joint and most of them are contemporary and modern now. We visited the manufacturing plant of a fiberglas seat company when we were planning our mat. We asked the owner, why he was not expanding his line so it could be less "dated" because I told him I was turned off by the dated look of the typical fiberglas seat. The owner told us that he runs his production line 7 days a week and stays busy year round so there is no need for him to change the style of what he produces. Until the fiberglass seat manufacturers stop receiving orders, we will continue seeing the "same old thing" produced. We went unconventional and are very pleased with what we did. Larry is right - we are hoping for input to help guide the direction of the new lines. But the nature of the forum is open discussion so I understand it's an arena for sharing helpful things among yourselves as well. We have a couple prototypes that are nearly done now and more on the way. We will do our best to get the word out once we have workable models and if any of you are planning to go to Clean, be sure to stop by our booth. In the meantime I'll keep passing along any helpful feedback I get to our designer. I think the most important things in seating are 1) durability 2) comfort 3) style 4) price. In tables, I love, love, love the table you made for us. Customers compliment us for the style and love having the shelf. Installing them back to back is genius, especially with customers chatting and visiting while folding. I hope you share our pictures when showing off your lovely work. Hey! I think four of those toploaders were in my store when I bought it. It was funny, I don't know what I was thinking, but one of the toploaders had an old out of service tag on it. I figured, "Well, let's see." I turned on the water, plugged it in, put in the quarters and...water everywhere! I got it all turned off, opened the lid and the whole agitator assembly was simply...missing. It's interesting to see that 35 year-old top loaders look identical to Speedqueens you can buy today. Kind of fitting into the motif of this whole thread. The chairs from the youth detention are in some of my stores. I'm sure when new they were a little better looking but considering when I bought them they had been sitting in a field for 2 years, they were pressure washed and put into action. New they are about $1,200 each but although not "attractive and modern" they are surprisingly comfortable and unbelievably durable. I recently purchased some of the restaurant type that Larry mentioned. By far the most popular seating in the stores. 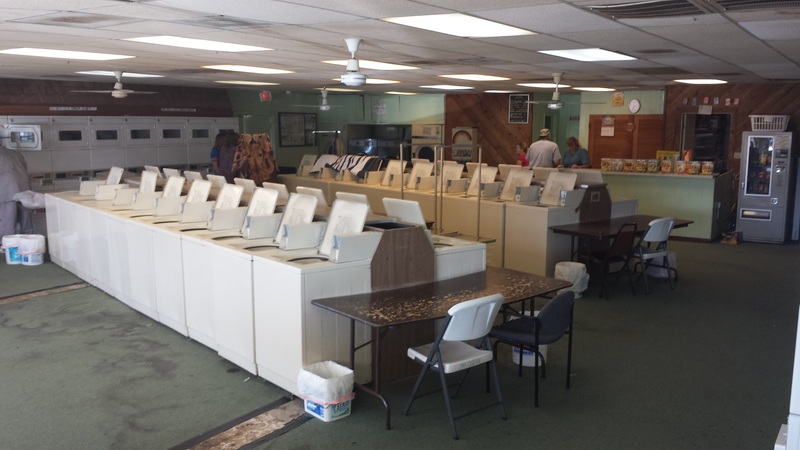 Here is a more recent photo of the laundry with all the top loaders and green carpet. We bought HighMark folding tables and they are beautiful. Go to our facebook page or website to see pictures. Does anybody besides myself who has mixed feelings about flat surfaces anywhere in our laundromat that can camouflage some customer's liquid spills & possibly even actual dirt since no laundromat can clean after every movement of each customers? With some patterns decorative surfaces ... an occasional customer could unwittingly be caught by surprise. If they see it beforehand .... they would be more likely to avoid the more serious potential unpleasant mishap. Regarding the possibility of spills on folding tables, I think that is an issue whether you have a decorative pattern or not. We try to watch and we always ask customers to eat or drink in the seating area since the folding tables are for clean clothes. We are nice about it and customers are nice about moving. One reason not to have a solid color folding table is that, since laundromats are lint factories, lint is less visible on a patterned table. 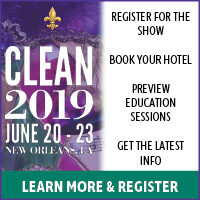 Hoping that you have some new items on display at the Clean Show! Martha - thank you for the kind words. I'm glad you and your customers like the tables so well. Your store looks beautiful! Gail - yes, we will definitely have some new furniture on display at the Clean Show. And to everyone giving us your input - thank you! Our goal is to have more things to offer in every furniture line used in the industry and to have some different price points to work for everyone. I look forward to having some things to show everyone and look forward to seeing some of you in New Orleans in June.